The 8500ProHD by Cobra is one of the industry's most complete truck-specific navigation systems, certified the highest in route quality and reliability. Enter your truck's height, weight, length, width, and load information and the 8500ProHD will lead you to your destination safely, legally, and on-time. This GPS comes standard with Free Lifetime Map updates. This Truck GPS packs a ton of features into one easy to use platform. This is the best GPS for any professional truck driver . The 8500ProHD features easy-to-read graphics, Junction View with Lane Assist, quick tab menus, a State Mileage Log, and Hours-of-Service Timers. Truck Drivers are in for a big bonus! 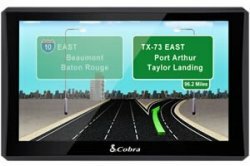 In addition to the main features, this GPS also packs in the industry's best last-mile routing, offering superior road coverage on secondary highways. This GPS Navigation with Truck Routes will help cut fuel costs, out of route miles and costly fines. Drivers will find "Lane Assist" a true godsend. How's The Weather? Find out with the 8500ProHD! This Pro GPS allows you to view live weather information in a number of different ways; different weather overlays may be viewed on a map, or a summary of current weather conditions may be viewed for your current location or for your destination. An active Wi-Fi connection is required to receive live weather information. Quick-Tabs allow drivers to see critical information such as the distances to weigh stations, travel centers, rest areas and mile markers at a glance. Junction View with Lane Assist provides drivers with 3D images of upcoming highway junctions as well as lane guidance and enhanced turn-by-turn directions. State Mileage Log tracks miles driven within a state for IFTA reporting. I'd just like to say - Your customer service is top notch!